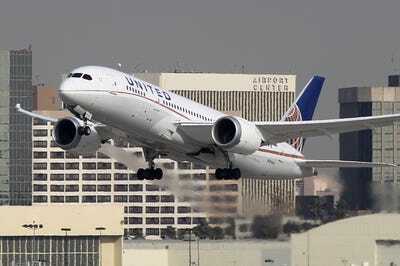 David McNew/Getty ImagesA Boeing 787 Dreamliner operated by United Airlines takes off at Los Angeles International Airport on January 9, 2013, in Los Angeles. A United Airlines plane flying from Los Angeles to Sydney, Australia, made a mayday call and safely completed an emergency landing after the pilots realised they were running low on fuel, according to reports. USA Today reports an Australian Civil Aviation Safety Authority spokesperson said the measures taken by Flight 839 were done strictly as a precaution, having hit a fuel reserve threshold that requires the captain to declare a “fuel mayday” emergency. A United Airlines plane flying from Los Angeles to Sydney, Australia, made a mayday call and safely completed an emergency landing after the pilots realised they were running low on fuel. USA Today reported that Sydney emergency services had radioed that the plane – a Boeing 787 carrying 180 passengers and 14 crew – had “fuel issues and has issued a mayday,” saying that a full emergency response was mobilized by police at the airport. Peter Gibson, an Australian Civil Aviation Safety Authority spokesperson, told USA Today the measures taken by Flight 839 were done strictly as a precaution, having hit a fuel-reserve threshold that requires the captain to declare a “fuel mayday” emergency.